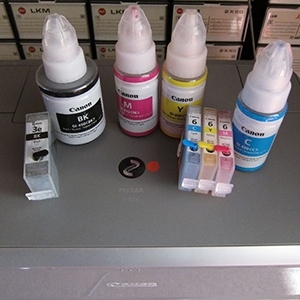 Discussion in 'Canon InkJet Printers' started by Miikael Volkonski, Apr 8, 2019. Use the "Prevent Paper Abrasion" opten as mentioned previous in post #8.. But is it OK to use it all the time? Because when I use this I get a warning that the print quality may be affected. Also, I've used that paper before and this problem has not occurred. Then I printed an image using the profile from the manufacturer. Now, when it happened, I printed the calibration sheet and no profile was used. Could this cause it? It is ok to use it all the time, and yes it does say that Print quality MAY be affected, but it rarely does, and profiles have no relation to print problems such as these. If you have used that particular paper before and had no problems then you should look at how you store your paper stock, it maybe that the paper is not been kept flat. How do I get inside there? Just open the lid and spray from there or... ? Just open the lid and spray from there or... ? Yes, and use a flashlight to see more clearly.. Right, but is it possible to move the ink tanks out of the way to the most left? I don't think my hand can fit in there to mop. Are any window cleaner OK or should it be a certain kind? Like not contain water for example? To get the print head to move, just raise the top lid as if you were going to change an ink cart, then pull the power cord from the wall and move the print head by hand over as far as it can go to the left side, that will give you clear access. Done. And no effect. Btw, paper was stored in the box - perfectly straight. The problem cannot be there. Happens with all the papers. What about cleaning the underside of the print head? I found some videos about removing the print head of other Canon printers and it looks fairly simple. Remove inks, open the bracket and take out the print head. Is it as simple with Pro 10s? And it's probably necessary to do the alignment after this again, correct? If you wish to remove the head to clean the underside of it, then just open the lip and when the print head stops in the middle of the carriageway, remove the carts one by one, then lift the locking arm on the right side and lift out the head carefully. Moisten a paper towel with window cleaner and wipe off the excess ink, then put everything back in reverse order, making sure the lever lock is secure, then close the lid, and it will be necessary to run another head alignment, automatic or manual, your choice, aftwer the printer has run it's customery purge cycle..
P.S. Don't forget to print a nozzle check before you comennce any other operation. I found some videos about removing the print head of other Canon printers and it looks fairly simple. Usually Canon includes installation instructions with diagrams on how to initially setup the printer which includes installing the print head. If you threw them away then here is a video of the initial install procedure. Installing the print head is at the ~2:00 mark.